A couple of (past) one-off jam gigs of a purely improvisational nature. We may do it again, we may not. I plan to post video from these gigs... eventually! They were pretty good, actually. 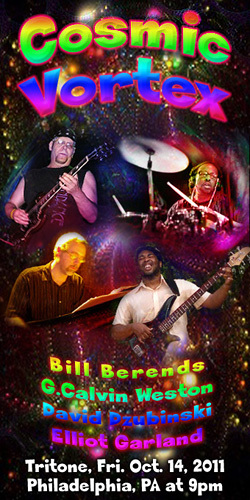 Free Electric Jazz-Rock-Blues fusion mayhem. Never twice the same, this second show promises to be as interesting and unique as the first. Spontaneous composition in the spirit of Jack Johnson era Miles Davis and pre Mahavishnu McLaughlin, take a trip thru the cosmos and the universal mind. Featuring core members of the Treasures of the Spirit band in a unique and free musical dimension without boundaries, expect the unexpected. Spontaneous composition in the spirit of Jack Johnson era Miles Davis and pre Mahavishnu McLaughlin, step into the sonic vortex with us for a trip thru the cosmos and the universal mind. 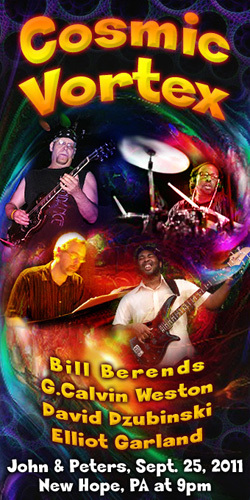 Featuring core members of the Treasures of the Spirit band in a unique and free musical dimension without boundaries, expect the unexpected.